The Molescent Biax Series of fluorescent fixtures is created from a blend of lightweight polypropylene and aluminum. The Molescent houses high output, 55w Biax fluorescent tubes, available separately, with on-board, dimmable flicker-free ballast and 2 power switches. Optional light shaping accessories, such as a louver, diffuser, filter frame and barndoor sets, are available separately. 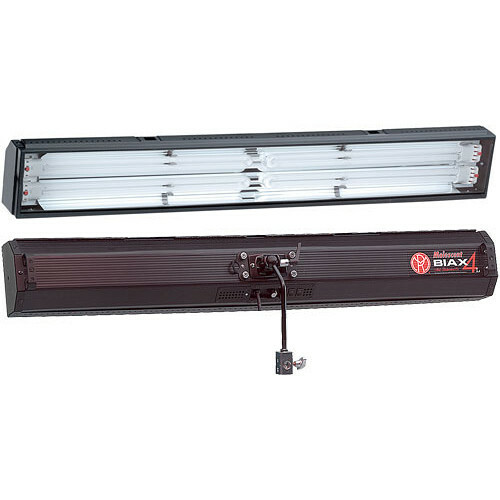 This is a 4- tube, 220 watt 46 inch long fluorescent fixture with rear-mount bracket. It is suitable for lighting wide sets, where vertical space is limited. This fixture operates on 220 volts AC current. Two separate rocker switches -- one for each 2 tubes.